Six Month Smiles is a tremendous new orthodontic solution that utilizes clear bracket braces to straighten your teeth in six months. They have earned the nickname “braces for adults” because the Six Month Smiles treatment allows those who would have difficulty wearing traditional metal braces because of work, time or simply embarrassment to get the straight smile they want without the hassle of metal braces. Six Month Smiles was specifically designed for adults and teenagers over 15 who have crooked, crowded, or spaced teeth without any major bite issues. It is a simple, convenient solution over metal braces. Our Trinity and Palm Harbor patients love the results they achieve with the Six Months Smiles treatment and we think you will too! We’ve included below some of the most popular benefits of Six Month Smiles braces for adults. Six Month Smiles clear bracket braces hold a number of advantages over other teeth alignment methods. SPEEDY | Six Month Smiles can achieve great results in substantially less time than other types of braces. As the name implies, 6 Month Smiles can have you flashing a beautiful and straight smile in just six months. This is a truly remarkable statement and helps to provide perspective on how far orthodontics have come. STEALTHY | Six Month Smiles utilizes clear braces that can be just as effective as traditional orthodontics that use metal wire braces. Using clear bracket braces instead of harsh metal brackets and wires eliminates the “metal mouth” look. Don’t worry, the clear bracket braces are strong and effective. CONVENIENT | Fast and comfortable follow-up visits during and after the treatment period make for a more convenient orthodontic solution. COMFORTABLE | While the way braces look are a primary concern for most, comfort plays a huge role too. With 6 Month Smiles, the discomfort – which is to be expected when teeth are shifted around in the mouth – is muted in comparison to traditional orthodontics. Six Month Smiles clear bracket braces reduce force and stress on your teeth, resulting in a higher degree of comfort. TREATMENT OF A VARIETY OF ISSUES | Six Month Smiles can be used to treat a variety of dental alignment issues, including cross bites, overbites, crowded teeth and gaps between teeth. You need not worry that the 6 Months Smiles treatment is less effective than other orthodontics solutions. BRACES FOR ADULTS | Clear bracket braces for adults enables adults to create the straight smile they’ve wished they had for years. Because of the speed and stealthiness Six Month Smiles braces for adults offers, this wish can become a reality. For most patients, Six Month Smiles braces for adults are a viable solution for a straighter, more attractive smile. Schedule a consultation today to find out if Six Month Smiles is right for you. We’d be happy to answer all your questions and share our success stories with you. 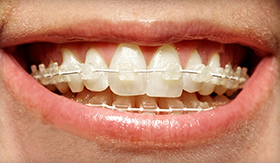 Traditional metal braces are usually worn for two-four years. Unlike metal braces, this procedure straightens teeth in an average of just 6 months. It uses low pressure to gently move teeth. Teeth then shift comfortably until they are aligned. Six Month Smiles offers other benefits too. First, it isn’t noticeable! The Six Month Smiles system utilizes specialized clear brackets and tooth-colored wires, making them virtually invisible. Second, the procedure requires fewer dentist visits and is typically less expensive than traditional braces. Finally, the Six Month Smiles system is more comfortable on your gums and mouth: you don’t have to worry about sharp metal wires poking and prodding you. A beautiful smile is a huge asset in today’s world and cosmetic dentistry is growing in popularity every day it seems. Understandably, many of our patients are interested in Six Month Smiles. The great news is most of our Trinity and Palm Harbor patients in need of tooth braces are candidates. However, as with other cosmetic dentistry procedures, it’s necessary that you meet with our fantastic team first to make sure Six Month Smiles will work as a tooth braces option for you. Below is a list of frequent issues the Six Month Smiles tooth braces system can address. Overbite : An overbite is moderate to severe overlapping of your top teeth over your bottom teeth. Six Month Smiles tooth braces can help pull your teeth in and align your smile. Open Bite : An open bite refers to a smile in which the front top and front bottom teeth do not come together. Crowding : Just as it sounds, crowded teeth push each other out of alignment. Six Month Smiles tooth braces are a great solution for this. Spacing : Gaps and spaces between teeth is another cosmetic dentistry issue the Six Month Smiles treatment excels at solving. Reverse Smile : A reverse smile is when the curve of your teeth goes the opposite direction than your lips when you smile, i.e. the corners of your mouth go up when you smile while your teeth look like they’re frowning. High Canines : The goal of cosmetic dentistry is to create YOUR perfect smile. High canine teeth (think fangs) can be corrected with Six Month Smiles. Cross-bite : The Six Month Smiles treatment will align teeth that are not matching up with, or crossing, their “counterpart” on the upper or lower teeth. Click on the image below to view an infographic about Six Month Smiles. Will Insurance Cover Six Month Smiles? It depends on your insurance policy. If your policy includes teeth straightening treatment, then yes, it would be covered under your insurance. How Long is the Teeth Straightening Treatment? On average, teeth straightening takes about six months. Times vary based on the patient’s unique situation. When you meet with our dentist we will give you a good idea of what kind of time frame you’re looking at to complete the teeth straightening process using Six Month Smiles. The recommended minimum age for straightening teeth using Six Month Smiles is 15. Should I visit a dentist or orthodontist for Six Month Smiles? The Six Month Smiles treatment can be administered by your dentist or orthodontist. However, our track record of success and concern for your comfort makes us a popular choice. How Effective are Six Month Smiles at Straightening Teeth? Six Month Smiles are very effective when it comes to straightening teeth. Amazingly so in fact. The technology used in the treatment is truly impressive and has changed the game of orthodontics. Do Six Month Smiles Braces Require Extra Maintenance? Six Month Smiles utilizes a special wire that gradually straightens on it’s own. This means less maintenance for you as you may not need to go through the uncomfortable tightening sessions you might experience at the orthodontist. Will Six Month Smiles Fall Out? No. The braces hold snugly in place like traditional metal braces. You won’t need to worry about losing or misplacing them – or worry about your child losing or misplacing them. What Level of Comfort Can I Expect With Six Month Smiles? Because the pressure exerted in the Six Month Smiles treatment is slow and steady, the discomfort is muted compared to traditional braces adjustments you may experience at the orthodontist. Schedule a Six Month Smiles Consultation Today! Fast, comfortable, nearly invisible, and convenient, the Six Month Smiles alignment program is a more modern treatment regime to an age old problem. If you’re looking for a quick fix to crooked teeth, Six Months Smiles might be the solution you’ve been looking for. Call us today to schedule a visit to either of our offices in the Palm Harbor or Trinity area, near East Lake!